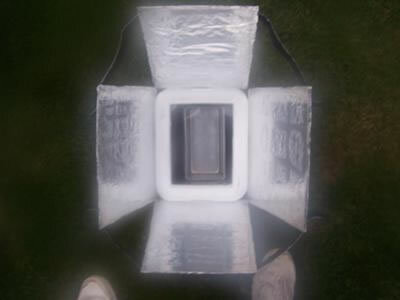 I built my solar oven from an old styrofoam cooler covered with a piece of glass scrounged from a picture frame, aluminum foil glued to the inside walls and cardboard with aluminum foil reflectors siliconed to small craft hinges and held in place with velcro. I was going for the highest degree of recycled materials in the design. It works well and gets up to over 275 degrees. I do have to place any food in plastic bags (I use freezer bags - they're thicker). It is excellent for soups and stews. I also pasteurize my mature compost in the same bags. It kills any seeds or fungus. It is extremely lightweight so it's easy to transport but is also easy for the wind to blow over. I usually place heavy items in close proximity when it's windy. Thank you for the very well described and presented solar cooker expose'. It definitely will be of inspiration to others who are looking to "do it themselves". I like the fact that you have been able to use it for things other than cooking only. I am going to have to do the same with my compost. I put my food in cooking bags to keep the steam from fogging the glass and cooling the temperature down or you periodically need to pop the lid and wipe the glass on the inside. I used only Elmer's glue to fasten the foil to the Styrofoam. After the first heating all the water will be leached out so do a "first burn" without food to break the oven in. After repeated uses the foil started melting the Styrofoam, so ideally the foil should be glued to wood, which won't melt. If making beef or venison jerky make sure the lid is not closed tightly - leave it cracked a little bit or the meat will not dry properly. Keep trying new stuff with your solar oven! Hi, I was wondering why do you have to put your food in bags. Also, did you use construction adhesive and glue to put together your oven? If so, does that effect the taste and safety of the food? I'm looking to make beef jerky in a solar cooker. 275 degrees is pretty good.